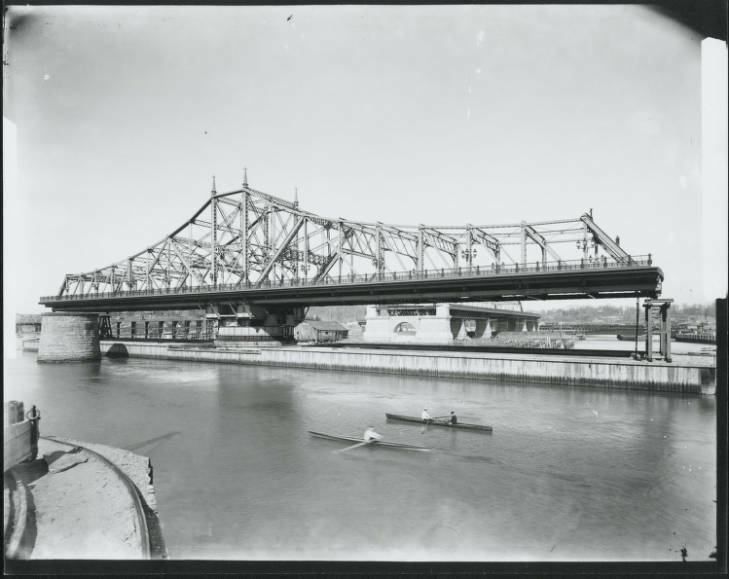 Completed in 1895, Macombs Dam Bridge is the third oldest bridge in New York City—a graceful metal truss swing bridge over the Harlem River linking West 155th Street in Manhattan to the South Bronx. A walk across it doesn’t take long. But as you stroll along the pedestrian pathway at the edge of the span, past its 19th century stone towers, finials, and decorative lighting fixtures, you’re treated to a unique panorama of a city waterway few New Yorkers ever see. It’s a view early 19th century residents who lived in the sparsely populated areas on both sides of the Harlem River knew well. They’ve been crossing the river at this point for more than 200 years. A few years earlier, a Bronx miller and landowner named Robert Macomb sought permission to build a dam here to help power his new grist mill on the Harlem side, states nycroads.com. 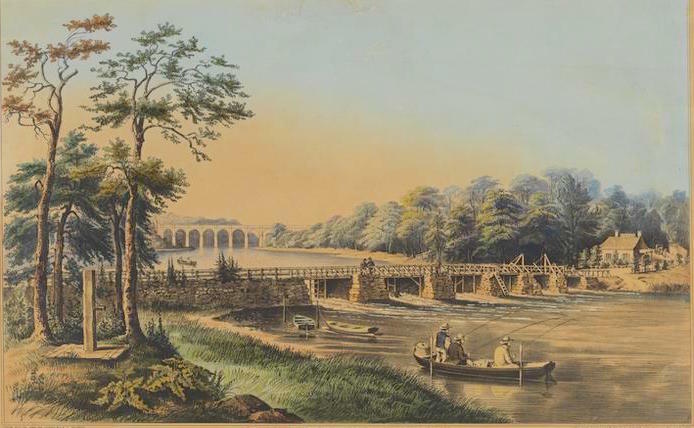 The state legislature gave the okay (the Bronx was in Westchester County at the time) with two stipulations: the dam had to allow ship traffic, and it couldn’t flood the salt meadows along the river. So Macomb built his bridge, but it was a huge headache for local people. They didn’t like the toll they had to pay to cross it, first of all (half the toll fees were supposed to help the poor). Also, the bridge hindered other vessels. 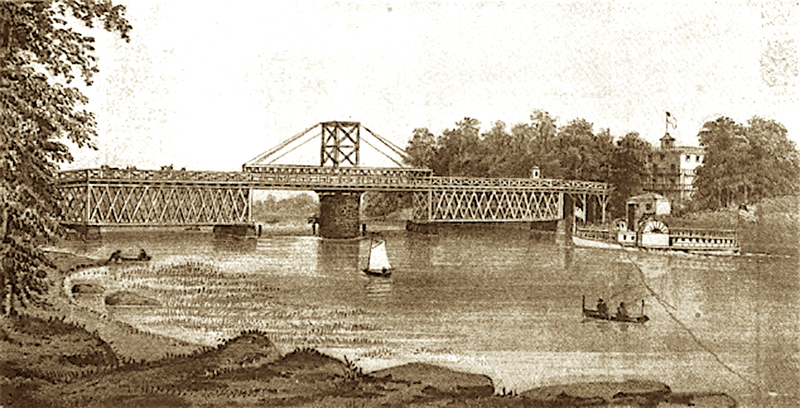 In 1838, fed-up neighbors reportedly paid the crew of a coal barge to hack the dam with axes. Another story has it that one local resident used his own ship to sabotage the dam in 1839. 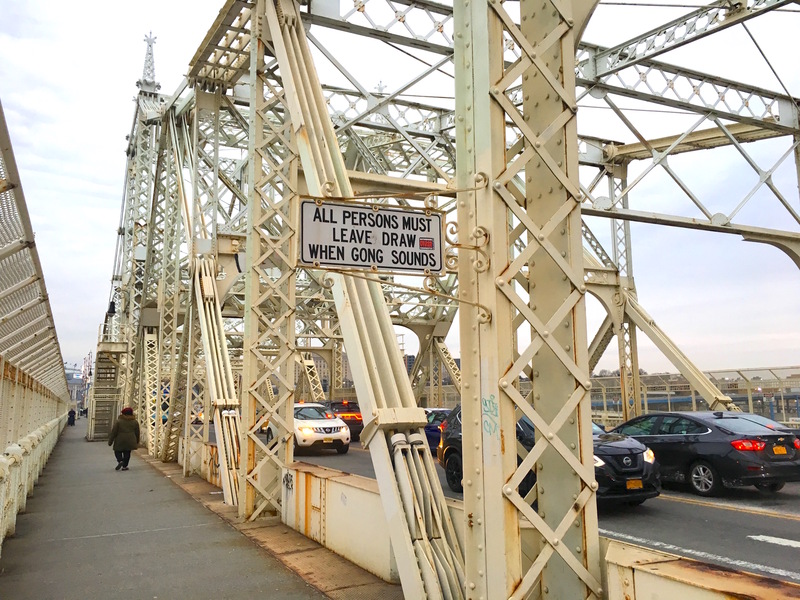 A court later determined that the dam and bridge were a “public nuisance,” and New York and Westchester County were told to build a new free bridge. 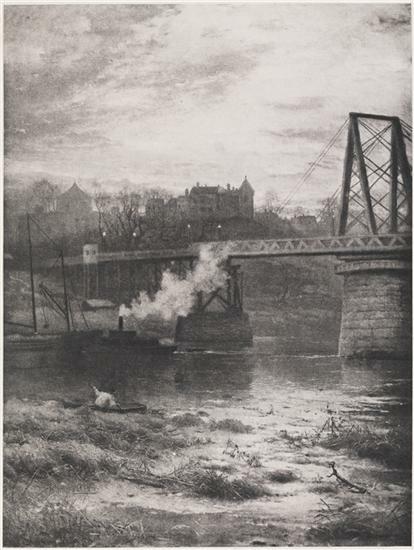 The second bridge was constructed in 1861 (above). Made of iron and wood, it was technologically advanced. But the wood planking on the roadway wore out quickly, and it had to be repaired and partially rebuilt many times. This was a major problem in part because upper Manhattan and the lower Bronx were rapidly filling up with people, hence more traffic. 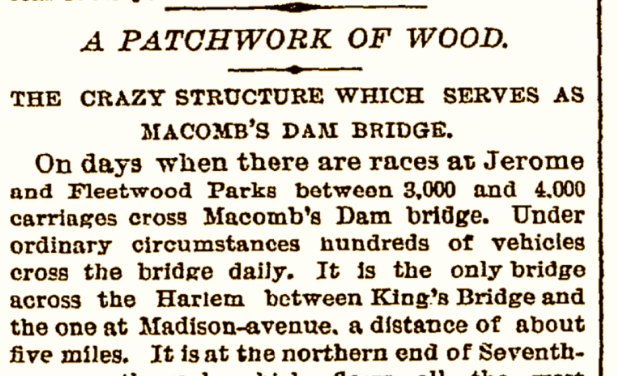 “Macomb’s Dam Bridge, over the Harlem River, is a rickety old structure, and its vibrations when crowded with vehicles and people are alarming,” wrote the New York Times in 1883. 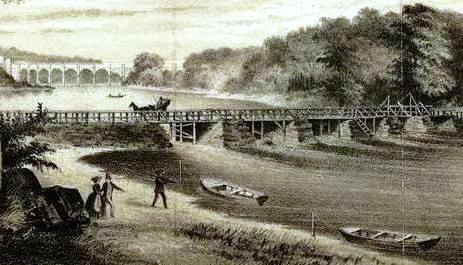 “On days when there are races at Jerome and Fleetwood Parks, between 3,000 and 4,000 carriages cross Macomb’s Dam Bridge,” another Times article from 1885 stated, referencing popular racetracks in the Bronx. Ultimately, the city decided that it would cost too much to fix the second bridge. The new one—the current bridge—made its debut 12 years after the Brooklyn Bridge opened. Today, walking Macombs Dam Bridge can make you feel very exposed. Before you stroll high across water, you walk above what was once the Polo Grounds, and today is the Polo Houses. Once you’re a hundred or so feet over water and closer to the Bronx side, the view is astounding. There’s Yankee Stadium straight ahead, and the glorious High Bridge, which leaps across the Harlem River about 20 blocks north. This entry was posted on November 26, 2018 at 6:28 am and is filed under Bronx and City Island, Politics, Upper Manhattan. You can follow any responses to this entry through the RSS 2.0 feed. You can leave a response, or trackback from your own site. How did the dam allow ship traffic? 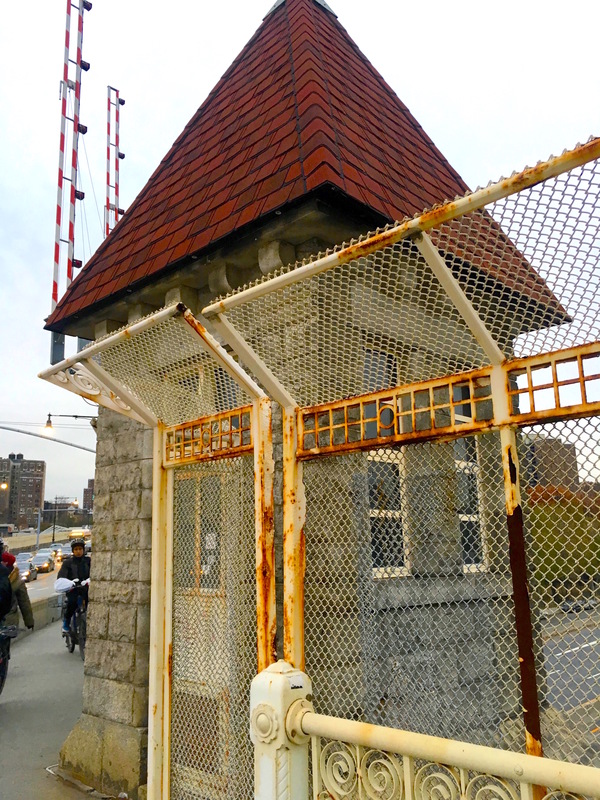 The Manhattan side of the bridge has some pieces of its connection to the Ninth Avenue Elevated remaining, now used to enable pedestrians to walk down from the bridge to 8th Avenue and the Polo Grounds and Colonial Park Housing Projects. You have to look carefully for these staircases. The 1951 World Series was the last one ever played in which you could walk from one ballpark (Yankee Stadium) to the other (Polo Grounds). However, I’m sure the two teams used a truck to haul their equipment over, and not shopping carts. I saw the staircase…it’s steep! I wanted to walk down but I was afraid I’d never make it back up before sunset!